Sunset over the seawall in Shishmaref, Alaska. This season, Threshold dives in to the complicated changes happening in the Arctic - and explores those shifts through the eyes of some of the 4 million the people who live there. We’ll start airing season two on consecutive Monday nights at 7 p.m., starting this Monday, October 1. Executive Producer Amy Martin joins us now to talk about what to expect. Eric Whitney: Amy it's great to have you back in studios in Montana Public Radio. Amy Martin: Thanks for having me. EW: You're presenting season two of Threshold, which we're all excited about. I haven't had a chance to listen to any of it yet. I'm really excited to hear it. For season two, you went all over the Arctic Circle with eight different Arctic countries, is that right? AM: Yeah, between producer Nick Mott and myself we went to eight countries. He covered the Canada portion. And I did the other seven and we were in parts of Alaska together. Yeah, it was great. EW: Why did you choose this topic for season two? AM: Well, I've been following climate change journalism for a few years, several years, and I think the Arctic just keeps coming up. If you care about climate, if you care about the future of the planet, the Arctic just keeps coming up. I think at first I thought the Arctic was just important for the Arctic’s sake. But the more I read about it and learned about it the more I realized it actually affects the entire planet. I was just assuming that a lot of people are like me where you're hearing about it, you think it might be important but you're not really sure why. And so I felt like it was a good opportunity to try to bridge that gap. EW: Seems like there's a couple of narratives out there. When we do hear about climate change in the news it's you know, “Does this politician or a government official believe in climate change?” or, you know, “Is this storm or are these fires caused by climate change or affected by climate change?” It sounds like you wanted to get beyond those narratives and go a little deeper. EW: I want to hear a little bit more about the people that you met there and you talked to but you also talked to a climate scientist, right? AM: Yeah, that's right. There's kind of three big categories of frozen stuff in the Arctic that we all need to know about. And that's sea ice, permafrost - which is frozen soil - and land ice which in the Arctic is primarily the Greenland ice sheet. So I had the opportunity to spend five days on the ice sheet with University of Montana glaciologist Joel Harper and his team of scientists and it was utterly fascinating, got dropped off in a helicopter you know with a pile of gear, watched it fly off into the sky and looked around and you can see nothing but ice in all directions like that's where you're gonna live for the next four nights. AM: It was fun and exciting. EW: What kind of things do he tell you? AM: All kinds of stuff. Joel's doing fascinating and important work, and one of the things that I think he's really trying to communicate is that the ice really matters to all of us. “The climate system itself is driven by ice. Even if you live in a southern latitude somewhere if there's big change in the poles it will impact how the climate system works and it will ultimately work its way down impacting you,” Harper said. EW: You said you also had a chance to visit with people who live in the Arctic Circle. And I don't I don't know much about people who live up there. I think I have like this elementary school idea of you know some some Eskimos living in igloos, but there's all kinds of people living in the Arctic, right? AM: Yeah, there are 4 million people who live in the Arctic and some of them are living, you know, very rural lifestyle in small villages but there are vibrant cities. In Russia I went to Murmansk which is the largest city in the Arctic with over 300,000 people. There are shopping malls, there's McDonald's, art galleries. You know, just anything that you would find in any city. So there's a wide variety of life and people and cultures in the Arctic and we really want to bring that out - that it's not just one thing. EW: Who are some of the people that you talked to who are being directly impacted by climate change in the Arctic? 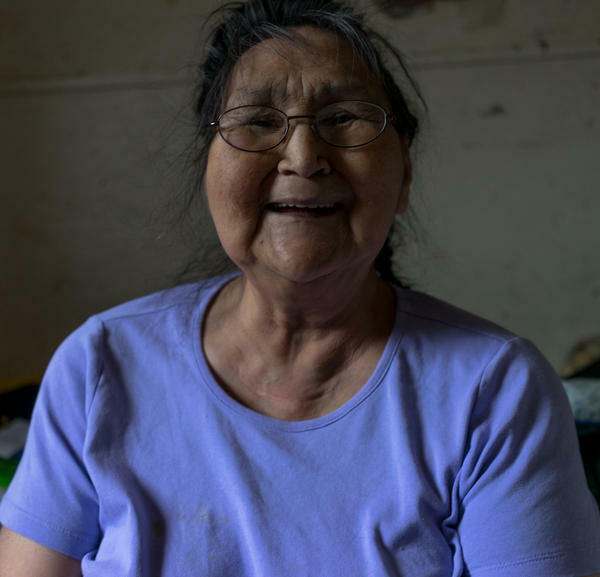 AM: Well one of the most interesting places that we went is Shishmaref, Alaska which is a small village on a barrier island in northwest Alaska. It's kind of become a bit of a poster child for climate change because they've had a series of storms that are actually eroding away the coastline of this small village so quickly that houses are falling into the sea. So Nick Mott and I spent a week there and one of the people we talked to was Kate Kokeok who had to move her house after one of these major storms hit. “Every time I think about it I just want to tell people my house now would have been right where the seawall is, had they not moved it,” Kokeok said. “Yeah. And if it wasn't for the seawall probably more would have been taken away, and had they not moved the houses they probably would have just fallen in. So when you think about it like that then it's like oh my goodness, you know. EW: Not much doubt in Shishmaref that climate change is real. AM: No, no, I mean it doesn't even it doesn't even come up as a question. It doesn't make sense to ask questions like: Is the sky blue? You know. Yeah. Obviously you're watching it happen. EW: But that can't be what they think about all the time. I mean people are just living their lives and you got to experience different kinds of cultures and different kinds of people in the Arctic, right? AM: Yeah, I mean it's interesting to see how all these things end up in, you know, interconnected. A lot of people -most of the cultures, the indigenous cultures in the Arctic, in all eight Arctic countries - have gone through a colonization process. So people were very eager to talk about that, and the way that that is continuing to impact their lives. And also people just wanted to talk to us about you know all the ordinary things that anybody talks about. Like, I want to get my kids into a better college or it's really important that we get better internet up here. For a long time, the Arctic has kind of been perceived by people in the southern latitudes as kind of like this blank slate that they can kind of come up and write on. They can, you know, try and hunt for whales, or look for oil, or, you know, make these epic journeys to the North Pole. And the people there have been kind of a footnote in all those stories, and I think people there are pretty sick of that and they're really excited to get their own message and their own words and their own cultures exported out to the rest of us. EW: Even in the recent past, even within a person's lifetime they've seen some pretty amazing change up there. “Us kids would be out and about, and then one of us would say let’s go listen to someone tell stories,” Kuzuguk said. “What happened to people when they were lazy?” Martin said. EW: Wow, what a great voice. AM: Word to the wise out there. EW: Yeah yeah. Note to self. We're going to hear from all kinds of people from all over the world it sounds like. AM: Yeah, and I think that one thing that that does in terms of informing the climate change conversation it allows for this whole range of ideas and emotions, honestly. I think a lot of people are like, “Oh my god, I don't want to listen to another climate change story, it makes me want to throw myself off a bridge.” You know, there's some heavy stuff in here you can't talk about climate change and have it all be you know sunshine and roses. But there's a whole lot of just interesting characters in the show and portraits of places that I think help ground the conversation in something that's a little bit more - a wider spectrum of experience that we can have with this question about climate change. Help expand the conversation to something that can move it forward better. EW: Tell me about some of the places you went and some of the memories or some of the things you're excited to let people know about on Threshold season two. AM: Well Sami reindeer herders in northern Norway, Inuit rock stars in Canada. We're going to be in some very interesting conversations in Russia. It was a big challenge to get into Russia and I think that we’ve got some tape from there that will be interesting for folks. 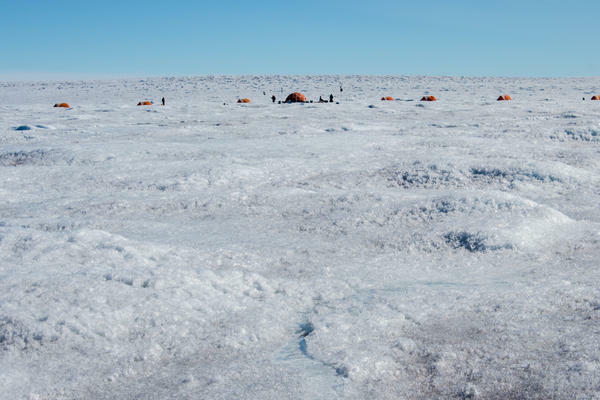 You're going to get to camp out on the Greenland ice sheet. I mean come on, who doesn't want to do that? With a University of Montana scientist no less. EW: Like I said we're really excited to bring people Season 2 of threshold Amy Martin thanks for joining us. AM: Thanks for having me. Amy Martin is the executive producer of Threshold. You can find the show on iTunes or wherever you get your podcasts - and its second season will air Monday nights at 7 p.m. on MTPR starting October 1.